Model deployment used to be a big task. Predictive models, once built, needed to be re-coded into production to be able to score new data. This process was prone to errors and could easily take up to six months. Re-coding of predictive models has no place in the big data era we live in. Since data is changing rapidly, model deployment needs to be instantaneous and error-free. PMML, the Predictive Model Markup Language, is the standard to represent predictive models. 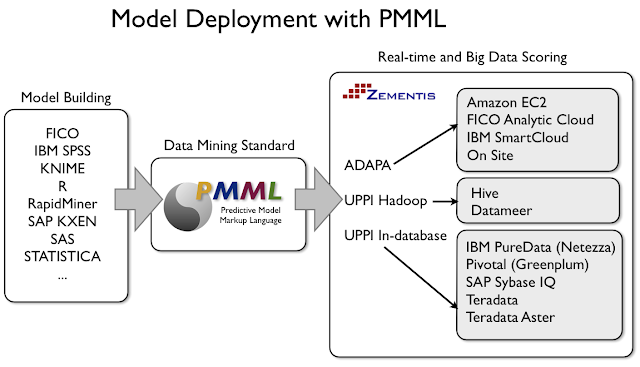 Given that PMML can be produced by all the top commercial and open-source data mining tools (e.g., FICO Model Builder, SAS EM, IBM SPSS, R, KNIME, ...), a predictive model can be easily moved into the production environment once it is represented as a PMML file. Zementis offers ADAPA for real-time scoring and UPPI for big data scoring which make the entire model deployment process a no-brainer. Given that ADAPA and UPPI are universal PMML consumers (accept any version of PMML produced by any PMML-compliant tool), they can make predictive models instantly available for execution inside the production environment. Check out the Zementis website for details.